As drought-stricken residents of Los Angeles’s hottest neighborhoods replace thirsty lawns with native plants, pavers and bare soil, new research has shown how their local climates could begin tipping back in the direction of their desert-like origins. Nighttime lows help people recover daily even as heat waves persist. In a region beset this year by drought and powerful heat waves, the widespread adoption of drought-proof landscaping is expected to bring warmer days — and much cooler nights. Overall, experts say the changes would help to protect residents from heat waves, which are being made worse by global warming. California, naturally prone to drought, is enduring the fifth year of a historically bad one. Droughts are projected to intensify in California as temperatures rise, reducing mountain snowpacks and soil moisture and potentially altering weather patterns. 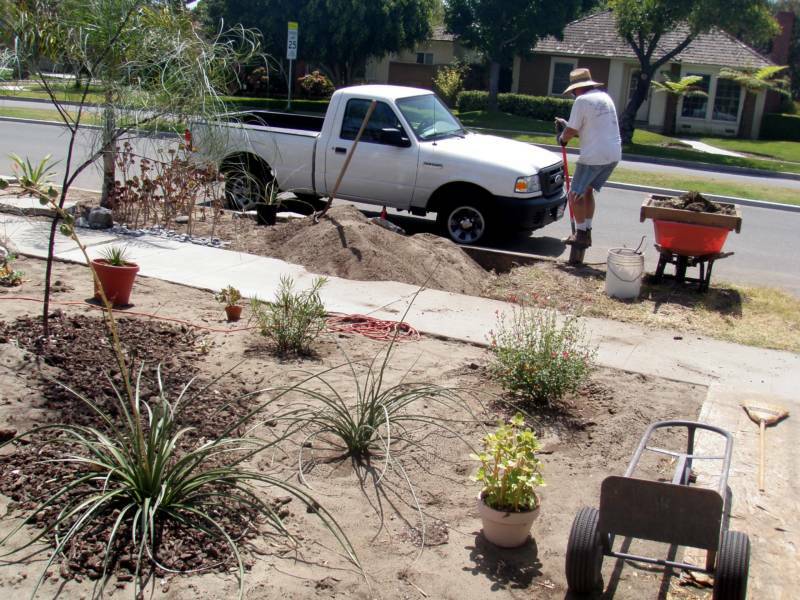 To cut water use, utilities and agencies have been helping Californians swap out their lawns for drought-hardy native landscapes. The L.A. Department of Water and Power says more than 24,000 of its water customers have worked to make the switch since 2009. “You can see the beginnings of some real change in landscaping practices,” said Alex Hall, a professor at UCLA who studies regional and global climate change. Done at a large enough scale, University of Southern California research published in Geographical Research Letters this month shows how the landscaping changes could affect the weather. Worsening heat waves are among the clearest and deadliest effects of climate change. 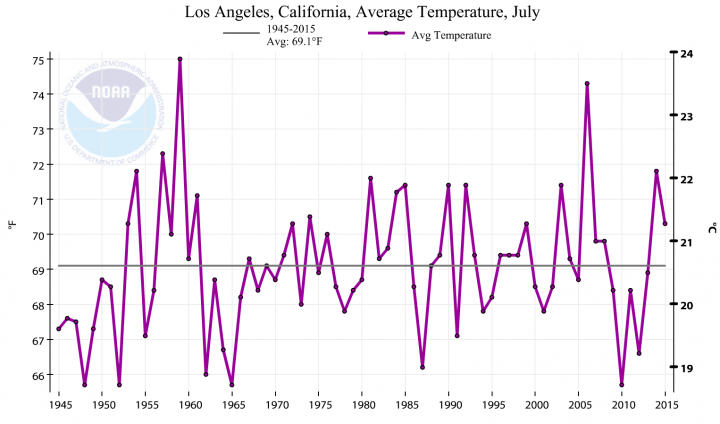 The research focused on July temperatures, when heat waves in southern California can be oppressive, taking their heaviest tolls on the elderly, the sick and the poor. Using models, Ban-Weiss and a colleague found that replacing lawns and grassy parks with native bushes and other drought-hardy landscapes would increase daytime temperatures throughout the metropolitan area by 1.3°F on average. That’s largely because irrigation water acts like sweat, cooling down landscapes. The study helps to inform a ‘what if’ thought experiment, in which a future L.A. morphs back toward its original state, free of irrigation, driven by worsening Western droughts. The findings may also be relevant to other cities where soils are wettened during summer more by sprinklers and hoses than by rainfall. In the suburban San Fernando Valley, where temperatures are among the highest, and where the natural environment was described in the 1880s as resembling that of a desert, daytime temperatures were projected to rise the most — by 3.4°F. That would seem to be bad news. Greenhouse gas pollution has warmed the planet’s surface nearly 2°F on average, and natural weather cycles have caused the West to warm faster than most other places in recent decades. Compounding the problem is the urban heat island effect, with concrete causing L.A. and other cities to warm faster than rural regions. But there was a nocturnal twist to the findings. At night, the modeling projected a cooling effect from the changing landscapes that would be exceed the daytime warming effect. Across L.A., nighttime lows were projected to fall by an average of nearly 6°F if irrigation suddenly ended. That’s a key finding, because nighttime lows help people recover daily even as heat waves persist. From a public health perspective, the findings point to a “net positive,” said Patrick Kinney, a professor who directs Columbia University’s climate and health program. “It’s generally thought that nighttime minimum temperatures are more important for health risks than daytime highs during extreme heat events,” Kinney said. Most of the water used in Los Angeles is piped in from other counties and regions, and most of that is used to water lawns and gardens. The new findings show that cutting back on irrigation in the low-rainfall metropolis could do more than just save water and the energy needed to transport it — it could save lives.